Noreen Roudon at the place near the Sunnyvale station where she was assaulted. A gutsy woman who fought off an attacker after he followed her from a train into a walkway is disappointed with his sentence - the equivalent of being grounded for three months. 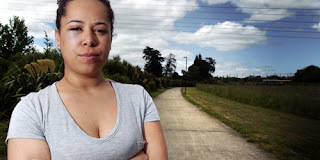 Last November, Noreen Roudon suffered a black eye when she was attacked by Jonathan Ray Lole, 27, who followed her from the Sunnyvale rail station in West Auckland and grabbed her as she walked home. It was early evening, still daylight, and Roudon fought back. She told the Herald on Sunday shortly after the incident that she was not usually a confrontational person. "But I turned around and saw him. I knew that I was fighting for my life. If he had a weapon, I didn't know. I just started punching, screaming, fighting and swearing." On Friday, Roudon, 27, was in Auckland District Court for Lole's sentencing. He will serve nine months' supervision and three months' community detention, during which time he must remain at his Henderson address from 7.30pm to 7.30am weeknights and 8.30pm to 7.30am on weekends. Community detention is effectively a curfew, a sentence which restricts an offender's movements during specified times. It requires an offender to remain at an approved residence at times set down by the court. This week, Roudon told the Herald on Sunday: "It was a bit of a slap in the face. I was disappointed." She had reluctantly moved out of her parents' house and in with her partner because she no longer wanted to walk from the train - and partly because Lole lived nearby. "I'm not scared, but I don't walk as much."